2018 Final Cage Maintenance and Thank You! I would like to personally thank each and every one of you for your participation in The Chesapeake Bay Oyster Reef Recovery Initiative. When we started our program seven years ago, our goal was to double our number of growers each year. In our first year, we attracted 16 growers. In our second year, we increased our ranks to 34. In our third year, we amassed a total of 84 growers. In year four, we had 162 growers. In 2015, we grew to a grand total of 257growers. The larger the number, the more difficult it is to double. For the next several years, as our new goal, we had decided to add a minimum of 100 new growers each year. In 2016, we grew to 322 growers. As of this writing, we have 385 growers, making us (you) the largest group of growers in the state of Maryland! 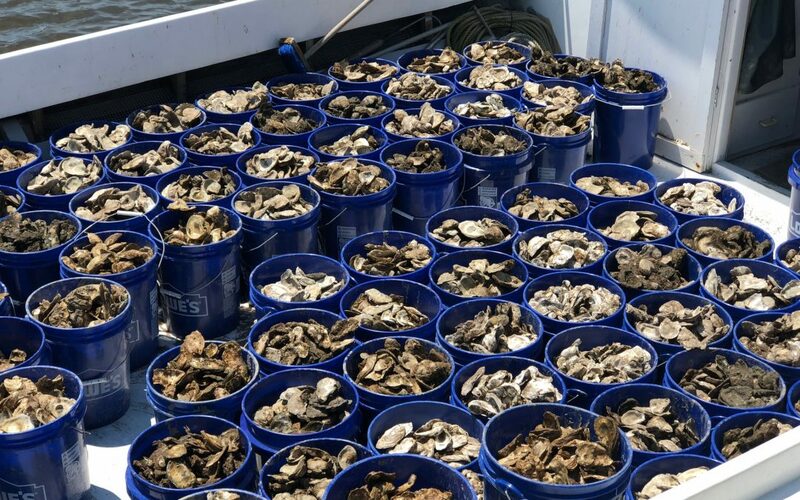 Just a few weeks ago when we planted your oysters on the sanctuary in the Tred Avon River, Chris Judy from the Maryland Department of Natural Resources conservatively estimated that 266,000 oysters were grown by all of you in your cages and planted on this sanctuary. Last year, we planted an estimated 223,000 oysters. That takes our two year total to 489,000 oysters! Great job! Here is what is so exciting about our project: In the wild, oyster reproduction canbe exponential. In just one year, a single mature oyster can produce up to thirty-five (35) new, viable oysters. The next year, that original oyster can again produce 35 new oysters, andthe 35 oysters it created in the first season can eachcreate 35 new oysters. So, in two seasons, just oneoyster can possibly turninto a total of 1,296 oysters. After three seasons, the number jumps to 46,656 – from just ONE oyster three years before! Also remember that each one of those oysters, when mature, can filter up to 55 gallons of water a day! Due to this miracle of compounding, our goal has been and will continue to be, to meaningfully increase our number of growers every year and to plant more and more oysters each year. When you look at the math, we truly believe that our collective efforts will actually make a significant difference in cleaning up the Bay and restoring the abundance of marine life that used to be. When our volunteers picked up your oysters several weeks ago, they left your cages on your dock. In our first two years, cage fouling had become a very large issue, not only in terms of inhibiting oyster growth, but also the heavy fouling and the incredible weight that they added to the cages made our volunteer’s jobs very difficult when it came to pick up and delivery. As a result, I decided to send out weekly cage maintenance letters during the times of heavy micro-organism growth. I am very pleased to report that the maintenance letters have had a very positive impact. In our first two years, 95% of our grower’s cages had very heavy fowling. In our third year, we had our volunteer corps rate every cage and here are the results: 1/3 had little or no growth/fouling, 1/3 had moderate growth/fouling and 1/3 had heavy growth/fouling. For the past three years, the numbers were even better: Only 17.90% of the cages had moderate growth/fouling and a mere 10.50% of the cages had heavy growth/ fouling. Thank youfor taking such good care of your cages! It will help us to keep our existing volunteers and attract new volunteers in the future. We simply cannot function without them and we thank you for your time and effort. To knock off loose, hard growth, gently but firmly bang the cages on the surface of your dock. Put the cages back overboard for 24 hours. This will cause the dry, hard growth to become soft and malleable. With a scrub brush and/or terry cloth dish towel, scrub the outside of the cages (scrub away from you to keep the debris from getting on you). Dunk the cages in the water to wash away the loosened debris. Next, open the cages and scrub the inside, then dunk the cage in the water to remove the loosened debris. Repeat step #3 several more times, if necessary, to remove all of the old growth. If your cages are heavily fouled, it is easier and takes less time to repeat the process rather than trying to get the outside/inside completely clean on the first scrub. Even with heavily fouled cages, it should only take you 5-7 minutes per cage to get them clean! (Also remember to scrub the debris from the rope). When you do your final cleaning, if you find that we have missed picking up any of your oysters, please call Julie at 410-822-9143 and she will make arrangements to pick them up. Thank you once again for all that you have done. Please let us know if we can help you in any way!